One of the biggest impact plays in last night’s SEC championship game came on the goal line as Alabama lined up in an unbalanced formation with heavy personnel on the field. 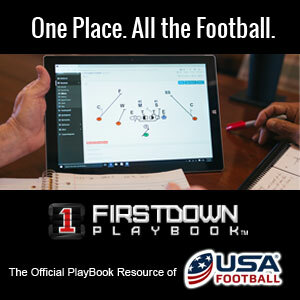 They ran a version of what we here at FirstDown PlayBook call Duo, which is a power play without pulling the guard. You are basically looking for as many double teams as you can get at the point of attack. Alabama had it well constructed but the extremely well coached Georgia defense played it about perfectly. They lined up in a solid goal line defensive front and shot the gaps on the snap. To us this was one example of how two very well coached football teams often times have a game that comes down to a crucial play one way or the other that is the deciding factor. This play is also a great example of how one small breakdown can lead to a chain reaction, and in this case actually ended up being the cause of a fumble on the one yard line. The extra tight end for Alabama is lined up with three bodies between him and the center, which makes it even harder to hear, particularly on a goal line play with the loud end zone. When the ball was snapped he was late off the ball and that started a chain reaction of events that could have changed the entire outcome of the football game.